I have worked to remove the <table> tag from a theme I was using with ETG, and the only related tags left are the <tr> and <td> tags in [#thumbspage.thumbstable#]. I cannot find a way to generate the thumbnail page with <li> tags instead of <tr> and <td> for each thumbnail. I don't really need number of rows and columns since my cleaned up theme is fully responsive. 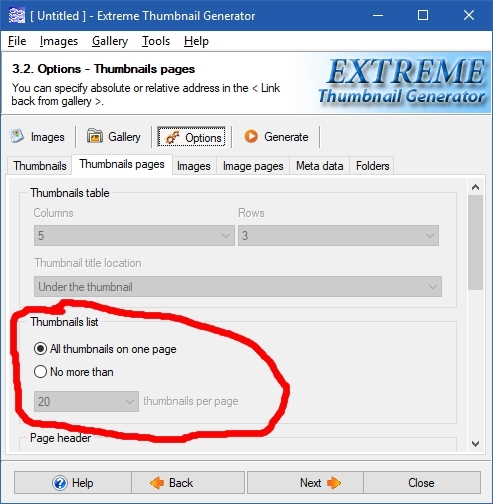 Is there a way to change the generation of thumbstable to use <li> instead of <tr> and <td>? Right now you cannot do that. But if you give me a piece of code that use <li> tags for the gallery images along with thumbnail titles - I can try to add it to the program. Thank you for answering! I'm glad to hear that you can help. Page still works responsively but I really want to use <li> instead of the <tr><td> combination, as <li> would be the correct tag. your id and class could be something different like id="li_thumbnail_1" and class="li_thumbnail_image", so that styles can be applied if needed. For me, I don't use thumbnail title, but you can also insert the thumbnail title in the <a> tag. The only actual reason <li> tags were not implemented yet is the control over the thumbnail title... So this issue must be resolved in order to add <li> to the program... Right now you have a lot of control over the thumbnail title and many customers make use of it in their galleries. Can <li> tags provide the same customization options? For example, can title be displayed above the thumbnail image? This essentially makes the thumbnail title a block element instead of inline, so the image will respect the DOM element order. This way the <li> container is fixed and the thumbnail title element will follow the DOM order, and wrap accordingly. The main reason why I am asking for a separate tag is to make sure all the existing themes continue to work without any problem. So adding a new ETG tag called [#thumbspage.thumblist#] would be the way to go because you don't have to modify any existing themes. OK, thanks for the info. I'll try to find out if it fits existing program interface. Any updates Maxim? I'm looking to redo many of my galleries as Google is penalizing me for not being mobile friendly...and I want to redo them with using <li> instead of tables. Thanx much for your help. Thank you for the update! Looks great. You can see the sample usage of the new tag in the new template called Thumbnails list (White). Please let me know if this is what you wanted and if there are any problems using the new tag and new version in general.